The Most Scenic Views in Washington, D.C.
Washington, D.C. is visually beautiful. Open spaces, manicured parks, grand avenues converging at landscaped circles and exceptional architecture fill America’s capital with endless scenic views. It is a tribute to the vision of George Washington and Thomas Jefferson, who helped plan America’s capital city, and the layout created by architect Pierre L’Enfant who designed it, that there are incredible vistas from iconic buildings and historical landmarks. Lincoln Memorial. 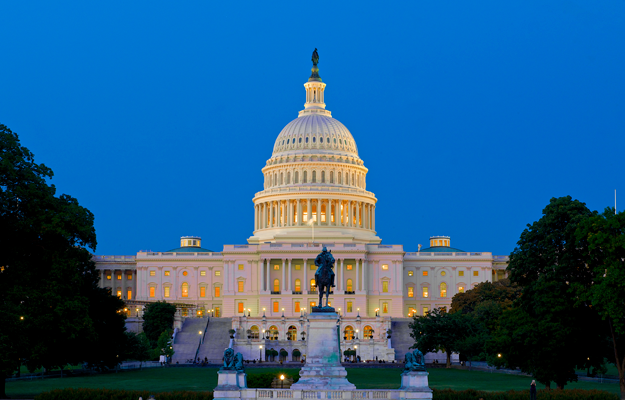 Sit on the steps at sunset to take in the golden glow on the reflection pool , the WWII Memorial and the U.S. Capitol. Jefferson Memorial. An incredibly scenic spot in its own right, this memorial is also a great spot to see the Tidal Basin, lovely year-round and spectacular dusted in cherry blossom pink. Turn towards the White House to check out that spectacular view. The White House South Façade. The stately North Façade of 1600 Pennsylvania Avenue, the most famous address in the world, is the main entrance, but the view of South Façade, technically the back of the house, is the best. The South Lawn, stretching between the fence, the fountain and the Residence is used by presidents and first ladies to host events. Shaded along the periphery are lovely plantings and trees, included by magnolias planted in Andrew Jackson’s presidency. Manicured lawn leads to a grand sweep of external double staircases on either side of the curved and columned South Portico. Arlington National Cemetery. 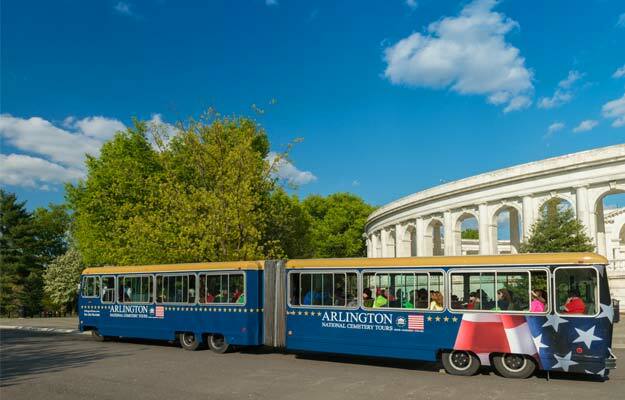 Take a memorable Arlington National Cemetery Tour to see some of the most scenic and moving sites in D.C. Set against softly rolling manicured green lawns, row after row of white grave markers stand in silent remembrance of the sacrifice of those who died defending the ideals of the nation. Shady clusters of Memorial trees stand in honor. The Tomb of the Unknown Soldier is forever watched, and the torch at gravesite of President John F. Kennedy always burns. One of the most picturesque views of the capital city is from Arlington House, a museum perched on a rolling hill. Monuments by Moonlight. Washington D.C.’s Memorials and Monuments are amazing to visit by day. At night, glowing in white light, they are beyond spectacular. See them on a Monuments by Moonlight Trolley Tour on a Washington D.C. Segway Night Tour or Monuments at Night Bike Tour. DC Ducks Tour. 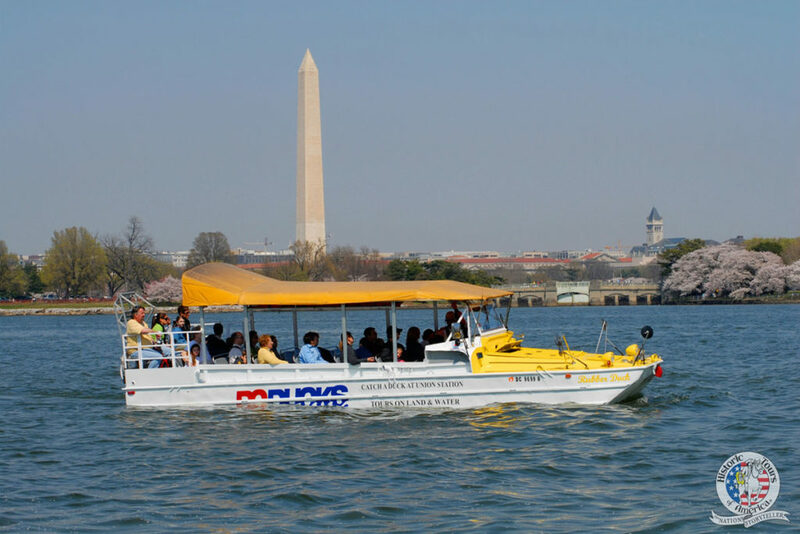 Splash down into the Potomac River in an amphibious vehicle for the water portion of the DC Ducks Tour. It’s super fun and being surrounded by D.C. skyline views on all side is phenomenal. Newseum. Dynamic, engaging, interactive, the Newseum is a visitor favorite. Seven levels, 15 theaters and 15 galleries are packed with exhibits exploring journalism past and present through the five freedoms of the First Amendment. The view from the 6th floor is phenomenal. Kennedy Center for the Performing Arts. A world-class venue for theater, music and dance also has a fabulous view from a wrap-around outdoor terrace which can be visited without going inside. Capture views of the Washington Monument and Jefferson Memorial or have lunch in the Roof Terrace Restaurant for higher-up views. Lafayette Park. The small, picturesque park across Pennsylvania Avenue from the White House North Entrance combines remarkable statuary and a lovely park setting in a federal-era neighborhood. With the exception of a statue of Major General Andrew Jackson in the center, four dramatic statues in the corners memorialize Revolutionary War heroes, all foreigners – a Pole, a Prussian and two Frenchmen – who came to the aid of the struggling Continental Army. Look at the pedestal of the de Rochambeau statue for an explanation of the unique bond. Georgetown Waterfront Park. Take a late afternoon stroll through one of the most romantic places in the city where views of along the Potomac River are lovely. Stroll towards the end of the C&O Canal to catch the sun setting over the Potomac. End the experience with dinner in one of picturesque Georgetown’s wonderful restaurants. Tidal Basin Parkland. Views across the water towards the Jefferson Memorial, FDR Memorial and, Martin Luther King Memorial are always awesome. Beautiful on any day, they are unequalled when the cherry blossoms are in bloom. Washington D.C.’s building height restrictions have created a city with unobstructed panoramic rooftop views. Hotel lounge bars, each with its own vibe, have some of the best. P.O.V. Rooftop Lounge & Terrace in the W. Hotel has a fabulous lunch and equally fabulous views. DNV Rooftop at the Kimpton Donovan Hotel is a hip spot with views of Thomas Circle and beyond. The venerable Hay Adams, long frequented by political movers and shakers, has an old world ambiance and amazing views of the White House. Mount Vernon. The iconic landmark and home of George Washington is a national treasure with lovely Potomac River vistas. 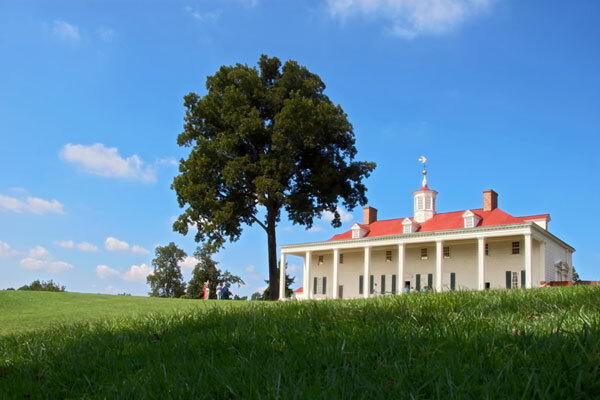 Take a Mount Vernon and Distillery and Grist Mill Tour for a guided tour of the 18th century home and a self-guided tour of the gardens, grounds and nearby Distillery and Grist Mill. Washington National Cathedral. A visit to the magnificent Cathedral in upper northwest D.C. is an all-encompassing experience. The architectural details are wonderful, the stained glass is spectacular and the over 100 gargoyles, each with a distinct personality, are great photo ops. For breathtaking views, book a Tower Tour, 333 steps up the central tower. United States National Arboretum. A scenic 446 acre wonderland is in Northeast D.C., 2.2 miles from the Capitol. Walk, bike, drive or take a tram tour to meander through hardwoods, meadows, flowering trees and shrubs. See Chinese gardens, herb gardens, a bonsai collection. A must see photo op: the National Capitol Columns in the Ellipse Meadow. Zero Milestone. A simple knee-high marker inlaid with a brass compass rose on the top in the Ellipse between the Washington Monument and the White House South Lawn was to be the exact spot from which all other roads in the country would be measured. It did not work. However, it’s a fun find as you walk towards the Washington Monument for a great straight-on view of the U. S. Capitol anchoring the other end of the National Mall. Capitol Columns. If you are not into flowers and trees, visit the National Arboretum for a photo of the the Capitol Columns. Looking a bit like Stonehenge, 22 sandstone Corinthian columns standing upright in an open meadow rise like silent sentinels against the sky. Once supporting the east portico of the first rendition of the U.S. Capitol, they were removed in 1864 in an expansion project, and finally found a home in the Arboretum in the 1980s. Capital Wheel . Drive 5.5 miles south of DC to popular National Waterfront in Maryland for panoramic views from the top of a Ferris wheel, 180 feet above the Potomac River. In the distance: the National Cathedral, Washington Monument, Masonic Temple, City of Alexandria and green parklands through the DC, Maryland and Virginia regions. Kids love it! Comments Off on The Most Scenic Views in Washington, D.C.